State of Wisconsin, Dane County---ss. of beginning containing in all one half (½) acre of land. her heir at law by virtue thereof. daughters all residing in Town of Deerfield Dane Co. Wis. Dated this 27th day of November A.D. 19 11.
and as to those matters he believes it to be true. 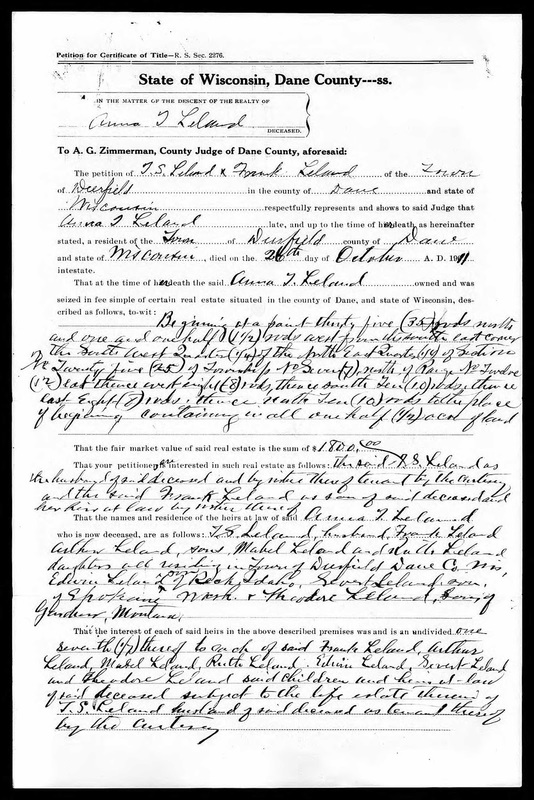 Dane County, Wisconsin, Dane County Probate Records, Dane > Box 372, Knox-W - Box 374, A-Mathison," images 1671-1672 of 1741, Estate of Elling Erickson Natvig, images 1091-1093, will of Elling Erickson Natvig, 1895; in "Wisconsin, Wills and Probates, 1800-1987," digital images, Ancestry.com (http://www.ancestry.com: accessed 10 September 2015). In this petition for certificate of title for land owned by Anna T. Leland, her husband and son provide her death date, the location of her land, and the names and current residence of the living children. 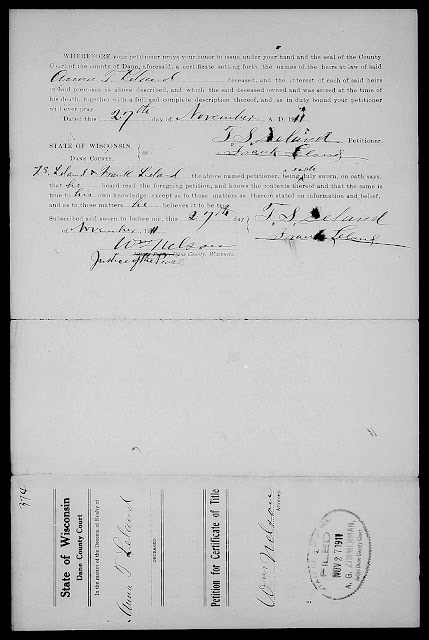 Anna (Natvig) Leland was married to Torger Sjursen Leland (1850-1933) and they resided, at least until Anna died, on the land of Torger's father, Sjur Torgersen Leland (1804-1889). Anna and Torger Leland had 10 children, but only seven of them were alive in 1911. My best guess is that this half acre may have been land that Anna was bequeathed by her father, or was bought with money inherited from her father, Elling Eriksen Natvig (1820-1896). In Elling Natvig's estates (see Amanuensis Monday - 1895 Will of Elling Erickson Natvig (1820-1896) of Cottage Grove, Wisconsin). She received $300 from the remainder of his estate. This one-half acre of land in Section 25 of Township 7, Range 12 East was just south of the town of London in Deerfield township. The plat map for 1899, 1904 and 1911 for this Section indicates that most of the southeast quarter of Section 25 was owned by Angus McVicar. Anna (Natvig) Leland is the great-grandmother of my wife, Linda (Leland) Seaver through her son Severt Oliver Leland (1878-1940). 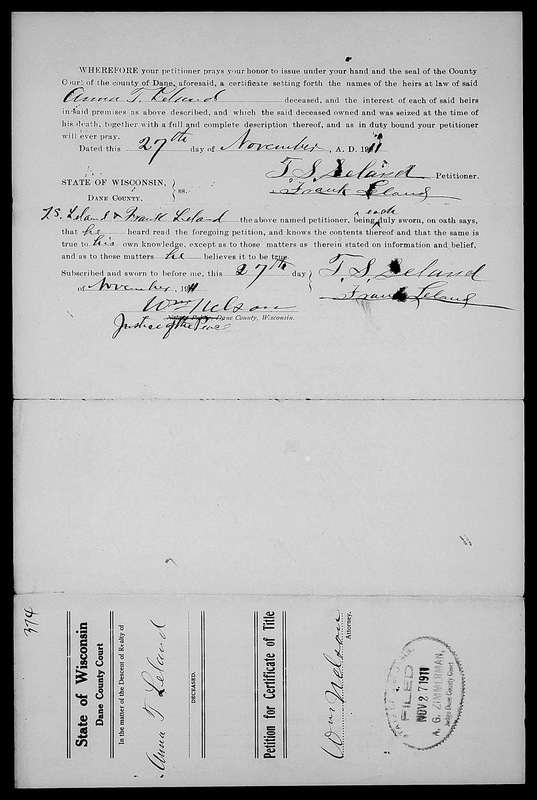 I need to find land records in Dane County, Wisconsin for these Leland ancestors of my wife.